Turkey is a unique country, boasting a vast heritage and eclectic mix of cultures and influences. Populated by over 78 million people, Turkey’s rich cultural landscapes, ancient wonders and natural charms add to its exotic appeal. Popular attractions include the iconic Hagia Sophia in Istanbul, Aspendos in Antalya, and the surreal rock valleys of Cappadocia in Central Anatolia. Get ready to explore Turkey’s ancient heritage and gorgeous coastlines because cheap flights to Turkey are now available! The country’s hub airport is Istanbul Atatürk Airport (IST), which is a 30-minute drive from the city centre. Istanbul Atatürk Airport serves a multitude of airlines, including Emirates, Turkish Airlines and Etihad Airways. Direct flights to Istanbul depart from Cape Town and Johannesburg via Turkish Airlines. Flight duration from Johannesburg to Istanbul is approximately 9 hours, 40 minutes. Discover the fresco-lined walls of cliffside monasteries and broken, ancient remnants of Byzantine, Ottoman, Hellenic and Roman civilisations. Underground cities, Lycian tombs and ancient theatres are just some of Turkey’s architectural wonders. Soak up the sprawling, white beaches, laced with the teal waters of the Mediterranean and Aegean Seas. Equally as majestic are the honeycombed hills and otherworldly towers of Cappadocia and cascading thermal terraces of Pamukkale. Explore the coastline with yacht cruises and water sports galore. Experience a hot-air balloon ride over the stunning landscapes or traverse the villages on horseback. The bustling markets are just as exciting to navigate as you shop to your heart’s content. Turkey is a melting-pot of East meets West, where each city has something different to offer. If you’re wanting to explore the ethnic villages and historical sites, the shoulder seasons of spring (April-May) and autumn (September-October) are ideal, as museums are less crowded and outdoor attractions are more pleasant in cooler temperatures. These are wonderful times to explore the conical canyons and valleys of Cappadocia, while camping and hiking along the coastal villages are a great retreat, as well as making the most of the quiet beaches and water sports in Izmir, Antalya and Bodrum. Summertime (June-August) brings peak crowds to the warm azure waters of the western and southern coastlines. In winter (November-March), the coastal towns shut their doors, apart from the festive months of December-January. While winter may not be ideal for lounging on the golden beaches, the snow-dusted peaks of Cappadocia and Istanbul’s crowd-free museums are well-worth exploring! For an affordable holiday in Turkey, take advantage of low-season rates between February-May and September-November. Straddling the diverse cultures of Asia and Europe, Turkey is a stunning destination displaying a rich history, vibrant culture, breathtaking landscapes, and incredible cuisine. 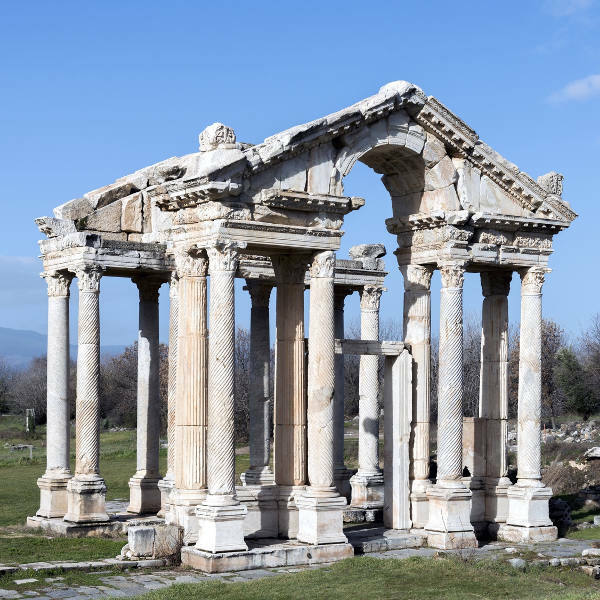 Whether you’re looking to laze on the buttermilk beaches or delve into its ancient history with the ruins of Ephesus and Pergamum, Turkey is brimming with spellbinding attractions. Combining influences from the Mediterranean, Middle East, Central Asia and the Balkans, you’ll find yourself meandering through ancient Roman theatres and mosques; while dervish festivals form just as much of the cultural landscape as football games and music concerts. The capital city of Ankara is a bustling metropolis, sporting ancient monuments and a lively nightlife. Istanbul, the vibrant cultural, economic and intellectual heart of modern Turkey, is home to a wealth of attractions, most notably the Byzantine church, Hagia Sophia. The holidaymakers’ playground is Bodrum, which is home to an array of trendy nightclubs, beach resorts and Roman antiquities. Further south lies the famous beach paradise of Ӧlüdeniz. Far west, the coastal wonder of Izmir is a shopper’s haven with its labyrinth of colourful bazaars and fragrant eateries. Grab your camera and discover central Aegean, where the UNESCO World Heritage Site of Pamukkale is an awe-inspiring vision. 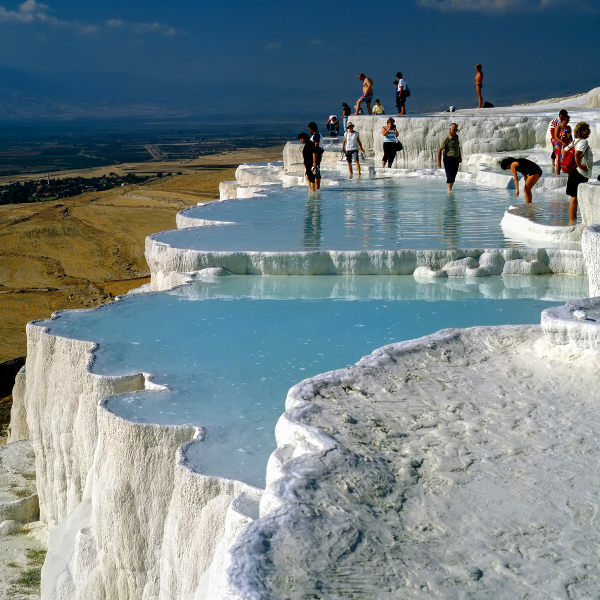 Its white travertine terraces and hot springs gush up to the ancient city of Hierapolis. 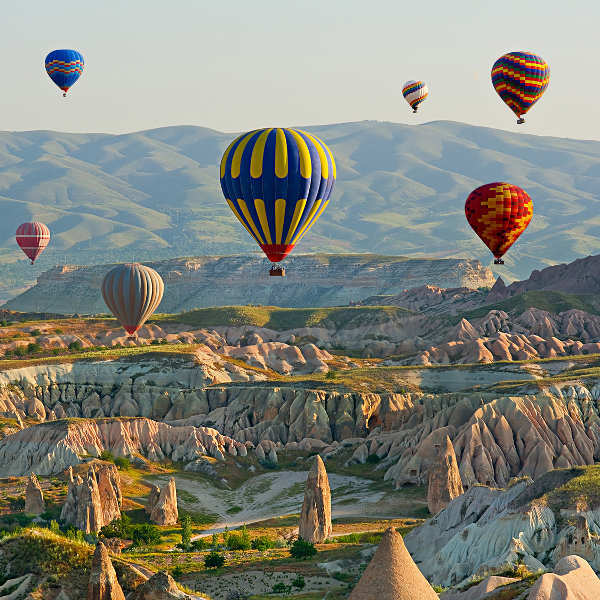 Coupled with this natural phenomenon is the enchanting landscape of Cappadocia – with its ‘fairy chimneys’ and caverns sprinkled among the villages. From swanky rooftop bars and idyllic beaches, to wondrous landscapes and majestic architecture, Turkey is an unrivalled destination. Compare several airlines, and book your cheap flights to Turkey online at Travelstart! South African passport holders do require a visa to enter Turkey. You can easily apply for an e-visa online at no charge. Visas are valid for 180 days, but your duration of stay may not exceed 30 days. Visit the consular website for more information. The South African Embassy is located in Ankara. South African Honorary Consulates are located in Mersin, Izmir and Istanbul. The Turkish Embassy in South Africa is located in Pretoria. Address: 1067 Stanza Bopape Street, Hatfield, Pretoria. There are no particular health or safety concerns for travel to Turkey. In spite of recent terror attacks, security has been stepped up and visitors should not feel the least bit worried about exploring this beautiful country. Nonetheless, do keep abreast of current affairs, particularly if you plan on travelling around the south-eastern region of the country. Keep in mind that Turkey is a predominantly Muslim country and cultural practices should be respected. Women are treated with courtesy, although some may fall victim to the emotional manipulation of local ‘gigolos’. Healthcare is widely accessible, although travelling with a basic health kit is always recommended. Pharmacies are called eczane and often stock regular brand names at lower prices than back home. Carry prescription medication in your hand luggage, clearly marked in original containers. There are no mandatory vaccinations required, but it is recommended to be immunized against typhoid and hepatitis A, as you are likely to be exposed to contaminated food and water. Be cautious of uncooked street food and stick to bottled water. Remember to pack in a good insect repellent to ward off pesky mosquitoes. A comprehensive travel insurance policy to cover theft and medical expenses is highly recommended.